During the Denver Johnny Bravo v. Boston Ironside National Championships final last fall, on a Bravo D point with Denver leading 9-8, Ironside handler Matt Rebholz called a foul following contact with Bravo defender Matty Farrell. Farrell wasn’t happy about the foul call and appeared to contest but an observer stepped in to immediately issue a team misconduct foul (TMF) to Farrell. Once the finals video came out, I was eager to look back at the footage to rewatch what preceded the call. I planned to write specifically about the TMF, but the footage of Farrell’s defense in the 42 seconds preceding the foul call was so illustrative of a number of important defensive fundamentals that I am going to pivot and focus on those basics of defense. At the Pro Flight Finale this year, I asked Bravo captain Jack McShane if there was anyone on his big-name-loaded team who was flying under the radar and deserved a little more recognition, and he immediately put forth Matty Farrell, brother of Bravo co-captain and US World Games team player Ryan Farrell, for his defense. So, let’s start by taking a look at the full 42 seconds of play immediately preceding Rebholz’s foul call. As the video begins, Bravo is just completing their transition from a junk set that they ran on the pull to a person-to-person defense. The Farrell/Rebholz matchup is highlighted and the video is slowed to half speed. Frequently, person defense is introduced by talking about how defenders should position themselves to cover stationary receivers on a stopped disc. In most cases, defenders are taught to front to take away the most dangerous cutting angle with their bodies. While there can be variations to this theme or even wholly different positioning strategies for person defense, fronting is often the default method for introducing defense. But these stopped disc situations cover about 0.1% of the time you are actually playing defense. The challenge for many developing defenders isn’t putting their bodies in the right cutting line on a stopped disc; it’s repositioning to continually take away that most threatening line as the disc and the receiver move and that angle changes. At higher levels, when defenders can maintain that line, there tends to be occasional physical contact, so the next step is maintaining balance when that contact occurs. In this short clip, Farrell demonstrates this concept of maintaining his line and balance. 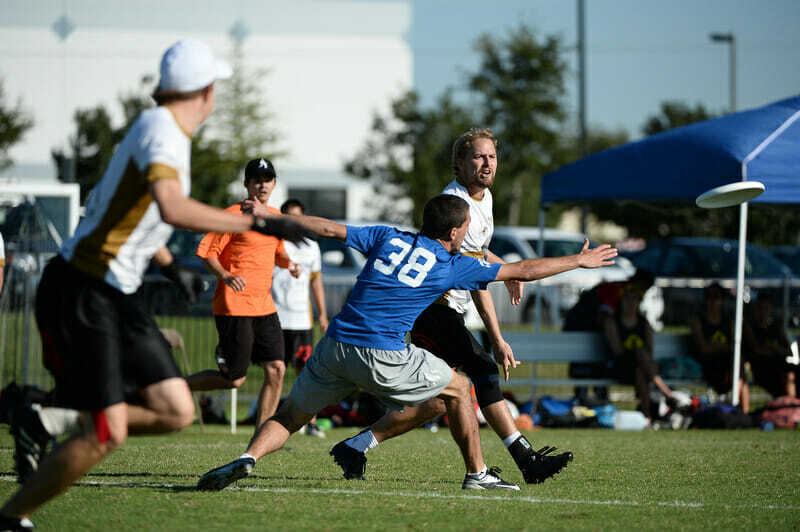 He not only begins in the line that is most dangerous, but as Rebholz moves and the disc moves, he is also constantly working to stay in that most dangerous line. As contact occurs, Farrell is low and balanced and absorbs the contact. This is a spot where strength training can really help; strong leg and core muscles allow you to take the contact. Farrell’s ability to maintain the line is most obvious at the very end of the clip, right before the foul call. Rebholz moves to the break-side.and then, as he comes back to the open side, he finds Farrell in the line he wanted. The resulting foul call is unfortunate as Farrell had every right to the spot on the field he was in, and it was Rebholz initiating the contact. Often, the optimum cutting line for a receiver can change rapidly. This dramatic change can occur on large swings or even on cuts that shift the receiver’s angle relative to the disc (e.g. moving from the break-side to the open side by crossing the vertical plane of the thrower). One specific technique that defenders can use to reposition when the line changes more significantly is called orbiting. Orbiting, like the name implies, describes the act of moving around your receiver while maintaining the same distance between you and your receiver. Orbiting is easiest to execute when the receiver is not moving and the optimum cutting line for the receiver changes due to disc movement, as is shown in the above clip. However, orbiting is sometimes necessary even as the receiver is moving and can be executed by moving around the receiver as the receiver moves. Notice that as Farrell orbits Rebholz he is doing so with his torso pointed straight at him, his body balanced and low, and his feet constantly in motion. He is maintaining sight of the receiver and the ability to react immediately should Rebholz begin cutting more aggressively. Many receivers are opportunistic; they simply wait for a defender to simply not be in the right line, lose vision or balance, and then they cut. Farrell’s sound techniques provide no such obvious opening. For Rebholz to get open, he has to force Farrell to make a mistake and that takes considerably more work, better cutting technique, and better timing. Another basic technique that Farrell uses in this clip is buffering and reeling. Buffering is allowing more space to the cutter you are defending as the cutter moves into a less threatening position on the field. Reeling is gaining back that relative space as the cutter’s position becomes more threatening. Buffering is most often seen when the cutter moves away from the disc. The cutter’s positioning means that (a) there is more time for you to make up ground on a throw and (b) there’s a higher margin for error on the throw and so the defender does not need to be as close. The defender can play looser and use that flexibility to clog lanes and play a little help D.
In this clip, Farrell clearly allows Rebholz more space as he moves across the field and away from the disc. Unfortunately for Bravo, an aggressive mark allows a wide swing out. Farrell is able to reel, gaining back that relative space to Rebholz by the time Ironside’s Will Neff catches the disc and Rebholz becomes a threat again. As I was watching this clip, a couple of great mark setting funndamentals demonstrated by Bravo’s Nick Lance also caught my eye. The first is checking your shoulder. If the disc is swung to your player, particularly on the break-side, as you are moving in to set your mark it is helpful to look over your shoulder to see what is happening downfield. What you see will impact your approach on the mark. As the disc swings across to Neff, Lance checks his shoulder twice while moving in to set the mark. He likely sees Danny Clark, the Ironside receiver who moves in at the end of the clip, and he positions his mark so that Neff can’t throw an easy continue to Clark. Second, in coming in to set the mark, Lance executes a technique we can call swooping. Instead of running directly to the mark in the shortest distance, Lance runs out toward the break-side lane to contain the continue pass and then closes down to set the mark. While swooping is a useful technique on its own, the information that Lance gained from checking his shoulder can inform how he swoops to maximize his effectiveness. For example, the speed and width of the swoop can be adjusted based on the new thrower’s downfield options. Effective swooping can limit the thrower’s ability to throw an additional throw to the break-side while the mark contains the new thrower, sets the mark, and resets the force. The combination of just these two players (Lance on the mark and Farrell on Rebholz) simply executing defensive fundamentals at a high level is almost enough alone to force a turnover, even after Ironside has gained a great positional advantage with their wide swing. The Bravo defense forces a very high count. But Ironside is able to get the reset because a Bravo defender gets a little greedy and stays in the lane while his cutter slips free for an uncontested reset. Farrell’s defense isn’t perfect (or perfectly legal) in this clip. My take is he fouls Rebholz once and possibly a second time in this full video. The first instance is when he isn’t positioned well and Rebholz beats him under. Farrell, having been beaten, runs into Rebholz’s back. Play stops here, but that is actually due to a pick called before this foul occurs. Some may disagree about whether this contact is a foul since Rebholz does stop in a way in which Farrell may not have been able to stop himself. The second possible foul occurs when Farrell appears to arm check Rebholz with some force. It’s hard to say for certain that Farrell fouls Rebholz, but the speed at which his arm moves after Rebholz moves away suggests that Farrell may have been pushing Rebholz. Again, this potential foul is debatable because Rebholz does also step into Farrell, initiating some of the contact himself. Overall, it’s a physical matchup between the two players with some arm checking and body contact going both ways. The majority of the contact is due to tight, positionally focused defense played by Farrell while most of the contact is actually initiated by Rebholz. Rebholz’s foul call on Farrell that ends the clip is clearly a bad foul call, and the TMF completely unwarranted (or should perhaps be charged to Rebholz for making an unnecessary call). Of course, in USAU play it’s the observer’s job to also sustain the pace of play. If the players themselves are unable to find a clear line that they are able to both respect, it’s the observer’s job to set that line. If the context for the TMF was that the pace of play was threatening to be problematic, I think a TMF would have been due on both players as neither seemed to be really shying away from physical play. All that said, I’m interested to hear others’ thoughts on the appropriate role of observers in dealing with a situation like this. Comments on "Basic Concepts Of Person Defense In 42 Seconds"